Drakenstein Stud’s exciting new stallion Gold Standard is said to have settled in very well to his new home and has taken to stud life very pleasingly. The handsome bay is really enjoying his new job at stud, and has already covered 19 mares, with Gold Standard’s first three mares tested are all safely in foal –a great start for the Drakenstein new-comer! Gold Standard’s impressive pedigree and classy race record has ensure he has proved popular with breeders and he is due to cover some high-class outside mares in his first season at stud. The only son of Drakenstein Stud’s champion resident sire Trippi at stud in South Africa, Gold Standard ranked among the best horses of his generation as a three-year-old, when he downed a high class field to win the G2 Selangor Cup. 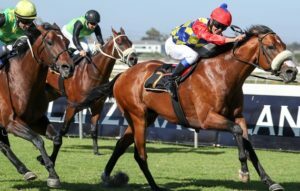 The bay, who earned nearly R1 000 000 during his career, also finished second in the 2016 G1 Cape Guineas and a close fourth, behind older rivals, in the 2017 G1 Sun Met. Gold Standard is one of 72 stakes winners for his champion sire, who has an exceptional crop of 3yos representing him this season. Among potential star 3yos for Trippi this season are brilliant G3 Spring Spree Stakes winner Chimichuri Run, G1 Thekwini Stakes runner up Railtrip, impressive recent winners Trippi’s Express and Trip To The Sky, and unbeaten Perfect Promise Sprint winner Lesedi La Rona. 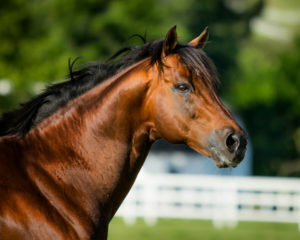 Drakenstein Stud’s new stallion is from a superb female line, with his dam Olympic Dam a daughter of two of South Africa’s greatest equine athletes –Model Man and Olympic Duel. The latter, dam of G1 Daily News 2000 winner Flying Duel and second dam of Equus Champion Thundering Star, won 12 races, with her seven G1 wins including all of the G1 J&B Met, G1 Champion Stakes and G1 Mainstay International.